As this update was being composed last night, the negotiations had been proceeding intensely throughout Friday, December 12, 2014. The ADP Co-Chairs and COP Presidency worked through Friday night. They proposed a new draft text at about 2:30 am, and convened the contact group at 3 am. The negotiation meeting reconvened this morning, Saturday December 13, at 10 am. through the late hours of Thursday evening and proposed a streamlined text. Negotiations throughout Friday proved that a second round of revisions might be needed. To facilitate timely completion of the negotiations, and a meaningful outcome, the Co-Chairs and the presidency worked through the night and came up with a new proposed text, to be negotiated on Saturday on extended time. 'equity' in the language of the draft text. Those who, like myself, come from the world of professional philosophy, recognize that 'fairness' and 'equity' are, at the end of the day, somewhat coextensive concepts. On an appropriate construal, and with adequate specification, they could be used alternatingly. For example, if a discussion became too stuffy and confusing over claims about equity, we – philosophers – would be willing to start over, reformulating and clarifying the issues by referring to 'fairness', instead, if it makes it clearer. Most of us would feel comfortable with this move because we are cognizant that, regardless of whether one uses 'fairness' or 'equity', the concept as such does not have a fully formed and prepackaged content, as if it were an immutable “thing” that that one would have to either accept or reject wholesale. Rather, the concept would need to be defined and worked out in the first place. Its scope, limits, and content would have to be specified carefully. So, the task is not that of choosing between prepackaged concepts, but rather about doing a decent job of specifying the concept, and then working with it. This is, after all, what we mean – typically – when we talk about developing a “normative framework”. So, why then is the distinction between fairness and equity so inflammatory at the negotiations over the global climate effort? insist on including an "equity" language in the draft text. The negotiating block regards 'equity', implicitly and explicitly, as having a fixed and immutable content. On this view, equity is inherently associated with Common but Differentiated Responsibilities (CBDR). G77+China is highly invested in the idea of securing a system of differentiated responsibilities through the negotiation process. The concept of equity serves as vehicle for this notion, as far as G77+China is concerned, at the negotiations in Lima. let go of the CBDR. G77+China regards CBDR as a necessary component of international cooperation that satisfies the requirements of justice. They regard the use of “fairness” in the language of the draft as watering down of ideals of justice. This is a very unfortunate situation, and could potentially jeopardize the entire process. Ultimately, there are many ways in which, within an agreement, fair terms of cooperation can be established. Not only different normative frameworks are possible, but they also vary in their appropriateness. And so, the question is to find the most appropriate normative framework for the architecture of a global climate regime that is effective, durable, and just. To insist on CBDR to be negotiated and imposed by a treaty top down, as the only option for a fair climate agreement, is to work with a overly narrow and rigid concept of fairness (or equity for that matter.) In fact, with imagination, ingenuity, and good will, it may be possible to structure the architecture of a new agreement on something other than CBDR, and advance the interests of developing countries to a far greater measure than through a rigid adherence to CBDR. the U.S. and the EU together show leadership, the problems may be resolved, but it's easier said than done. Let’s hope a deadlock can be averted this weekend. WHAT TO EXPECT FROM MULTILATERAL NEGOTIATIONS? The 20th session of the Conference of the Parties (COP 20) at the United Nations Framework Convention on Climate Change has convened on Monday, December 1, 2014, in Lima, Peru. COP 20 is of critical importance as the international community is currently working on a new climate agreement. As noted in previous updates from Warsaw in November in 2013, and from Bonn in June 2014, the negotiations are being conducted within a specific timetable known as the Durban Platform for Enhanced Action. This phase is expected to come to a close at COP 21 in Paris next December. Put another way, COP 20 in Lima is the penultimate annual meeting of the parties before Paris. For this reason, it is considered to be an important step. It is the meeting that will set the tone for the future of the global climate regime. To be more precise, it is in Lima that the text of the new agreement is to be fully drafted. In this opening update from Lima, my focus will be on some general reflections on the multilateral process on climate change. The updates from Lima will be thematically organized and, altogether, they will catalogue some of the main issues arising from Lima, while assessing their merits and shortcomings. My goal, today, is to reflect on the multilateral process in general, in an effort to carve out an appropriate framework for understanding the progression of political decision-making. In short, what exactly should we expect from the negotiations? First, the pace of the meetings during the two-week conference is, inevitably, going to be slow. At times, the discussions become highly technical and give the appearance of being focused merely on minutia. The reality is that every detail has to be taken into account and negotiated. For this reason, the multilateral process is bound to frustrate those who look for quick fixes, easy answers, and grand solutions. But those who are familiar with the intricacies of collective decision-making understand that it is not reasonable to expect policy to simply pop-up into existence. They need to be carefully thought through, taking into account the diversity of positions and standings. This is no different for a global climate regime. Second, what is being negotiated is unambiguously multifaceted. The agreement that is currently being negotiated includes both mitigation and adaptation components. These form the two pillars of negotiations. This structure distinguishes itself significantly from the previous era of climate agreements, which was focused solely on mitigation. Today, there is an understanding that mitigation and adaptation strategies must work in tandem. Any agreement on a specific issue – such as an agreement on finance, or transfer of technology, or loss and damage – has to be consistent with all the aspects of the overall agreement under the Convention. Given the deep differences between negotiating blocks, it is expected that the discussions will be highly focused, as opposed to being diffused and broad. Moreover, the language of the text is of great importance. Each word, or turn of phrase, needs be selected carefully to accurately reflect the nuances of what is agreed upon. Third, the decisions to be made in the current phase set the tone for the next stage ahead. What this means is that the various aspects of the agreement are open to be reconsidered and reworked in the future in light of new information, as well as lessons learned. The goal of the multilateral process, overall, is to set the building blocks of an effective and durable agreement, which also satisfies the requirements of fairness. What is important, then, is to reach the goals that are set for a given phase, and then move on to the next steps. Critics often disregard this feature of negotiations. They often assume that if a solution is not found and implemented at once, then the process is failing. Unfortunately, this assumption provides poor guidance. It frames the thinking within a highly restrictive box. Indeed, many are inclined to think that the focus on details, the technicality and tenuousness of the discussions are an indication of dysfunction. Some go as far as saying that not much gets done at the UN climate talks, and that the whole enterprise is futile. They are too precipitate in this judgment. Treaties and global agreements develop overtime and refine themselves through a process of rethinking and reconsideration. It is for this reason that the formal multilateral platform is of great importance. The formal platform provides an institutional architecture that sets, systematically and transparently, the conditions and methods for collective public deliberation and decision-making to take place. Like the workings of science, international negotiations on climate change within the Convention constitute an ongoing, self-correcting, and formal process, with a well-defined and stringent method. Looked at superficially and from a given time slice, it may look like little or no progress is made. Taken as a whole, it becomes clear that the overall effort moves forward, provided that the institutional structure within which it takes place is strong, transparent, and just. Stay tuned for further updates on the progression of the negotiations at COP 20. Department of Philosophy, York University. The following was originally published in YFile on November 3rd, 2014. The 15th annual Planet in Focus Environmental Film Festival, designed to enlighten, engage and entertain with film about the world, will screen the documentary film Honour Your Wordat York University Friday. Honour Your Word is written, directed and produced by Professor Martha Stiegman of York’s Faculty of Environmental Studies (FES), which is one of the co-sponsors of the film festival. FES Dean Noël Sturgeon will introduce the film, which will screen Friday, Nov. 7, from 3 to 4:30pm, in the Nat Taylor Cinema, 102 North Ross Building, Keele campus. Honour Your Word is an intimate portrait of life behind the barricades for the Algonquins of Barriere Lake, an inspiring First Nation whose dignity and courage contrast sharply with the political injustice they face. The title refers to their campaign slogan demanding Canada and Québec honour a precedent-setting conservation deal signed in 1991. A panel discussion will follow the screening with the filmmaker along with Barriere Lake Community spokesperson Marylynn Poucachiche and Shiri Pasternak of Barriere Lake Solidarity. Stiegman spent four years shooting the film called poetic and heartfelt, and one that challenges stereotypes of “angry indians.” Honour Your Word juxtaposes starkly contrasting landscapes – the majesty of the bush, a dramatic highway standoff against a riot squad, daily life within the confines of the reserve – to reveal the spirit of a people for whom blockading has become an unfortunate part of their way of life, a life rooted in the piece of the Boreal Forest they are defending. The film draws its audience into the lives of two young leaders: Marylynn Poucachiche, a mother of five, and Norman Matchewan, the soft-spoken son and grandson of traditional chiefs. Both spent their childhoods on the logging blockades their parents set up to win a sustainable development plan protecting their land. But it turns out signing the agreement was the easy part. Now, 20 years later, Norman and Marylynn are taking up the struggle of their youth to force Canada and Québec to honour their word. Their fight may seem an impossible one, but as we spend time with Marylynn, Norman and the community they are so deeply a part of, the audience grows to identify with the impulse driving a struggle that spans generations. For these people, standing up is a necessity, not a choice – and they are compelled to do so, despite the odds. York cinema and media studies Professor Brenda Longfellow of the Faculty of Fine Arts will present her interactive, oil-drilling documentary OFFSHORE as the Industry Day “Case Study”Friday, Nov. 7, at 1:30pm at Toronto City Hall. OFFSHORE, co-directed with Glen Richards and Helios Design Lab, is an interactive web documentary about the next chapter of oil exploration. “Extreme Oil” or “Cowboy Drilling” takes place hundreds of miles offshore, thousands of feet beneath the ocean floor, in dangerous and risky conditions where the hazards are immense but the profits are bigger, and where the consequences of something going wrong are catastrophic. OFFSHORE uses a virtual offshore oil rig as the central interface, combining an innovative mixture of virtual immersion and documentary elements. Beginning with stories from the Deepwater Horizon disaster and journeying to the Arctic, Brazil and Russia, the film probes the consequences and prospects of this new energy frontier. Trick or Treaty, directed by Alanis Obomsawin, a member of the Abenaki First Nation and a documentary filmmaker, will screen Friday, Nov. 7, at 8pm at Jackman Hall, Art Gallery of Ontario. FES Associate Dean Ravi de Costa will introduce the film, which explores “Treaty 9” of 1905, a monumental document in the history of Canada’s First Nations tribes. Obomsawin will be in attendance. She will also be part of a Master Class earlier in the day with journalist/author Geoff Pevere, from 2:45 to 3:45pm, at Toronto City Hall. Planet in Focus – Industry Day is organized by York grad student and alumnus Mark Terry(BA ’90). The day is devoted to providing creative and business content for filmmakers and opportunities to network with distinguished industry professionals. It will include a Green Screen Initiative Panel, from 11:30am to 12:30pm, discussing advances in environmentally sustainable production practices in film and television production. More information aboutIndustry Day can be found on the Planet in Focus website. Osgoode Hall Law School PhD Candidate Michael John Long (BA ’04, MES ’08, LLM ’11), an alumnus of York’s Master in Environmental Studies program, is the academic programmer at Planet in Focus and an executive board member at York’s Institute for Research and Innovation in Sustainability, which is hosting the festival at York this year. In addition, FES alumna Tzeporah Berman (MES ’95) will receive the Eco-Heroes Award at this year’s festival. The Planet in Focus film festival was started by FES alumnus Mark Haslam. To find out what other films and panel discussions are taking place in the Nat Taylor Cinema, check the Planet in Focus schedule. For more information on the festival, visit the Planet in Focus website. The following was originally published in YFile on September 25, 2014. Harvard University Professor Aaron Ellison and Elizabeth Farnsworth, a senior research ecologist with the New England Wild Flower Society, widely regarded as the power couple of ecology, will be speaking at York University on Oct. 2. Ellison will lecture about his experiences working and teaching in the Harvard Forest at Harvard University. The Harvard Forest is the University’s 1,500-hectare outdoor classroom and a living laboratory for ecological research. At 10:30am, he will deliver a talk titled, “Identifying, anticipating and intervening in ecological regime shifts”. The talk will take place in 306 Lumbers Building on the Keele Campus and is part of the Biology Department Research Talks. It is free and open to members of the York community. Then at 2pm in 009 Accolade West, Ellison will deliver another lecture titled, “Short and long-term impacts of undergraduate research experiences at the Harvard Forest” to the members of the Faculty of Science Committee on Teaching and Learning. In his role as a senior research fellow at the Harvard Forest, Ellison studies food web dynamics and community ecology of wetlands and forests, evolutionary ecology of carnivorous plants, the response of plants and ants to global climate change, and the application of Bayesian statistical inference to ecological research and environmental decision-making. He has authored or co-authored more than 100 scientific papers, dozens of book reviews and software reviews, and the books A Primer of Ecological Statistics (2004) and A Field Guide to the Ants of New England (2012). He is the editor-in-chief of Ecological Monographs and in 2012, was elected a Fellow of the Ecological Society of America. At home in Roylaston, Massachusetts, a rural town of 1,000 people, Ellison is a member of the Conservation Commission. At 7pm on Oct. 2, Farnsworth will deliver a public lecture titled, “Conserving the Rich Flora of Eastern North America”. The talk is co-sponsored by the Institute for Research and Innovation in Sustainability at York University, the Department of Biology and the North American Native Plant Society. Admission to this public lecture is free for university students who bring their identification, otherwise there is a $12 admission fee. “Elizabeth Farnsworth is a multi-talented biologist, whose work with the New England Wildflower Society builds bridges between the public and researchers in conservation Biology,” says Bazely. Farnsworth is Senior Research Ecologist with the New England Wild Flower Society, and a biologist, educator, and scientific illustrator. She is also editor-in-chief of the botanical journal, Rhodora. At the society, she co-led the award-winning National Science Foundation-funded project, Go Botany, to develop an online guide to the regional flora for teaching botany. 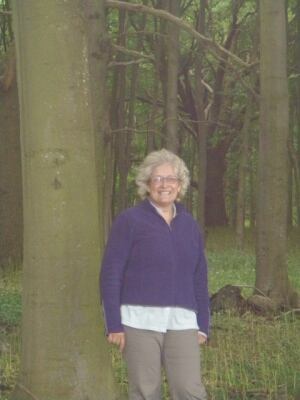 She previously coordinated planning for the conservation and management of over 100 species of rare plants. She has illustrated the Flora Novae Angliae, the Natural Communities of New Hampshire by the NH Natural Heritage Bureau, and three other books, and illustrated and co-wrote the A Field Guide to the Ants of New England (Yale University Press). She is co-author of the Connecticut River Boating Guide: Source to Sea and the Peterson Field Guide to the Ferns. Farnsworth is a member of the graduate faculties of the University of Massachusetts at Amherst and the University of Rhode Island, and has taught at Smith College, Hampshire College, and the Conway School of Landscape Design. She formerly served as ecologist with the Connecticut Chapter of The Nature Conservancy. She has conducted scientific research on many ecosystems throughout the world, focusing on restoration, conservation, plant physiology, mangroves, and climate change. She was awarded a Bullard Research Fellowship by Harvard University in 2005 and a National Science Foundation Postdoctoral Fellowship in 1999. She has been a scientific consultant to the National Park Service, The Trustees of Reservations, US Forest Service, Massachusetts and Connecticut Natural Heritage Programs, United Nations and the Mount Grace Land Conservation Trust. The following was originally published in YFile on August 1, 2014. What will an eco-village on the York University campus look like? That’s what students enrolled in the Design for Sustainability Workshop course in the Faculty of Environmental Studies were investigating. The course was created by the Institute for Research and Innovation in Sustainability (IRIS) in 2009 to help explore the topic of sustainability and rethinking public spaces on campus. A part of this course analyzed the mapping of future development on campus and conducted design audits. Course instructor, Arlene Gould, said the course is designed to “train and prepare the next generation of leaders.” Gould explained that the course participants demonstrated hard work and completed much research throughout it. The course is co-sponsored by the York University Development Corporation (YUDC) and Regenesis, an environmental and social justice organization on campus. This year, the course and its participants focused on a co-housing design charrette and building a community eco-village at York University. Co-housing is a concept that originates from Denmark and pertains to communities and housing. Eco-villages are planned communities that foster social interaction. Equally important are eco-villages that are sustainable communities. There were five student groups which examined various themes surrounding eco-villages. The groups’ respective topics of exploration included social model for co-housing, shared spaces, green technology, closing the loop (food and water education) and outreach. In the past, the Design for Sustainability Workshop explored the topics of green building strategies and sustainable housing models. Various industry professionals and community members provided input and imparted their knowledge to the student groups to assist with their projects. During the breakout session, the Green Technology group shared ideas with Martin Liefhebber, an architect with Breathe Architects. Liefhebber provided the group with information regarding green technology and design. After the breakout session and interacting with the industry professionals and community members, the groups were able to present their research a second time, incorporating the new information they had gathered during the session. This provided a more realistic view of what an eco-village on York’s campus could look like. 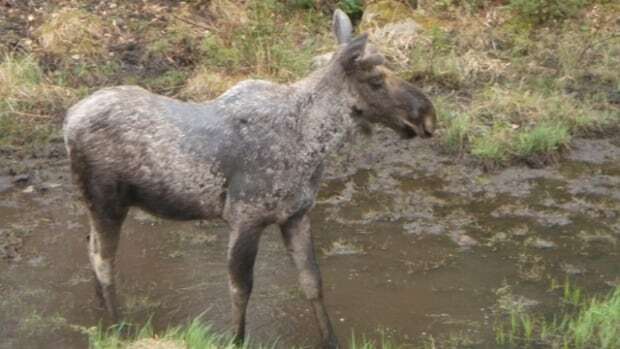 Researchers at York University have discovered that moose saliva may help the animals control a potential dangerous toxin found in the grass they frequently eat. A professor of biology at York University said biologists at the university enlisted the help of the Toronto Zoo in collecting spit samples from the captive animals. Dawn Bazely said the saliva was then applied to a grass which hosts the toxic fungus. The fungus in the grass that was coated with moose drool grew more slowly and produced less toxins than the control grass. "If you think about moose they have home ranges. So they may actually be re-encountering the same plants [and] they may get a benefit," Bazely said. "We certainly know the animals remember plants they encounter and they eat a small amount of the plant, and if it makes them feel ill they might avoid it in the future." She said the experiment grew from research looking at how grazing by moose affects plants. Over thousands of year,s plants have developed anti-herbivore defences like spines, thorns and bitter berries. Plants also reach out to a third party for assistance in deterring animals from eating them. "They can phone a friend to help them with defences," Bazely said. "And one of the friends they can phone is a fungus. Many plants have hidden inside them a fungus that is living entirely within the plant." Bazely said the next phase of research is to determine the benefit of the fungus-inhibiting drool. She said the spit acts quite quickly on the fungus, with noticeable results appearing in 12 to 36 hours. Deeply concerned by the widespread political violence that has racked Africa’s newest nation since mid-­‐December 2013, Canadian South Sudanese community members and leaders met in Toronto on March 26, 2014 to share information on the crisis, build peaceful relationships across the Canadian South Sudanese diaspora, generate options for bringing an end to the violence and for coming to grips with its underlying causes. 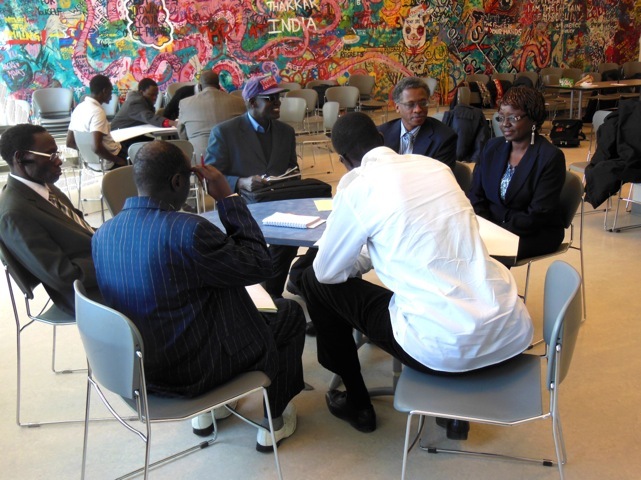 The day-­‐long meeting was hosted by York University’s Institute for Research and Innovation in Sustainability (IRIS), with organizational support from the SubSahara Centre, Peacemedia-­‐ paixmédia, Peacebuild – The Canadian Peacebuilding Network and South Sudanese community activists and opinion leaders. Discussion initially focused on sharing personal experiences of the crisis among the approximately 30 participants. It then turned to identifying the range of options available for short-­‐term peacemaking and long-­‐term peacebuilding, including tackling the country’s glaring governance deficit. 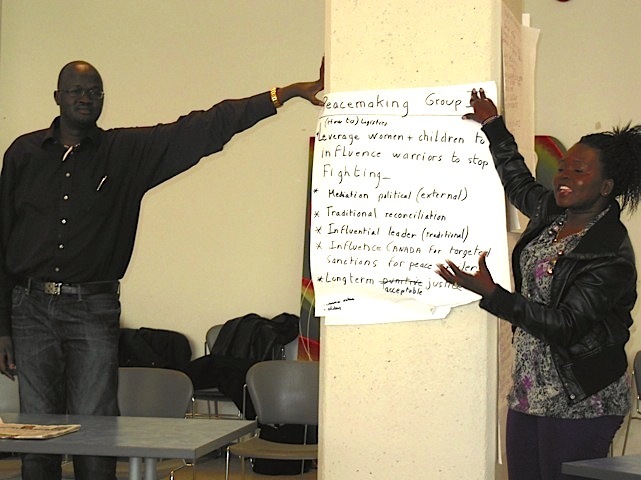 While strong tensions within the South Sudanese community in Canada and elsewhere were acknowledged, roundtable participants, representing a broad cross-­‐section of the South Sudanese community in Canada, pursued discussion in a spirit of solidarity and respect for all and their opinions. No insults or verbal abuse of individuals or specific groups were expressed, despite the depth of anger and sorrow. Each participant had the opportunity to voice their feelings and views on the crisis without interruption. Compassionate listening was encouraged. This report highlights the multiple common perceptions of the disastrous direct and indirect impacts of the violence on South Sudanese in their home country and in the diaspora, regardless of ethnic or religious background, age group, gender or educational attainment. It also sets out suggested collective responses to the crisis for urgent further consideration and action both in South Sudan and in Canada. To encourage open discussion during the roundtable, it was agreed that comments by individuals would not be attributed in this report, and a very few asked that their names not be included in the list of participants attached. View the full report from the Roundtable. The United Nations Climate Change Conference has convened in Bonn, Germany, on June 4 and is scheduled to go on until June 15, 2014. The Bonn conference is an “intersessional” meeting of the negotiating parties. These are sessions that are held between the Conference of the Parties (COPs), typically held at the end of each year. The present meeting in Bonn houses the 40th sessions of the Subsidiary Body for Implementation (SB 40) and of the Subsidiary Body for Scientific and Technological Advice (SBSTA 40) respectively. It also houses the resumed session of the Ad Hoc Working Group on the Durban Platform for Enhanced Action (ADP). The Bonn meeting is considered to be an important one as advancements made in this two-week period are expected to set the tone for the 20th session of the Conference of the Parties (COP 20) in Lima, December 2014. COP 20 in Lima is on the spotlight. This is because the text of a new legally binding international agreement on climate change, to come into force in 2020, is to be fully drafted in Lima, and then put on the table for agreement in Paris in 2015. Two highly positive developments marked the opening of the Bonn conference. 1. On June 3, the day before the conference convened, the President of the United States, Barack Obama announced a proposed plan to make 30% reduction in carbon dioxide in the U.S. power sector by 2030 from 2005 levels through EPA regulation. 2. China announced that it is working on a cap on its greenhouse gas emissions. This constitutes a historic first and opens up new opportunities for possible cooperation between major emitters on setting significant targets. In short, the Bonn meeting is taking place in a relatively positive atmosphere, with an express desire to get as much work done as possible in the wake of COP 20 in Lima. As for the specific issues, the Bonn conference’s special focus targets raising ambition on land use and areas of urbanization. Additionally, ongoing conversations on adaptation, the Warsaw International Mechanism on Loss and Damage, new approaches to climate financing, the idea of a new market mechanism to be adopted within the new agreement, and how to achieve a balance between market and non-market mechanisms to curb emissions figure among the central issues. Needless to say, questions continue to arise on equity. How should equity be understood within the parameters of a new agreement? How to conceptualize the distribution of responsibilities? What is the most appropriate formulation of responsibility within a universal agreement? Should the principle of common but differentiated responsibilities be revised or preserved in the current round of negotiations? How to determine each party’s contribution within the new agreement? These are not simple questions and do not have straightforward answers. But they give depth to the multilateral negotiations on climate change. Stay tuned for updates as the second week of the conference unfolds. On Tuesday, April 22 at 2pm, the York University community is invited to join York President and Vice-Chancellor Mamdouh Shoukri and Vice-President Finance and Administration Gary Brewer for an Earth Day Celebration in the Life Sciences Building. The Earth Day event, which will take place in the lobby of the Life Sciences Building, will pay tribute to a number of sustainability champions and achievements across York’s campuses. The occasion will include the unveiling of a plaque to commemorate the LEED Silver certification of the Life Sciences Building, and an announcement about sustainability at York University. The event will also feature the presentation of the inaugural President’s Sustainability Leadership Awards. Created to celebrate the many champions of sustainability at York, these new awards recognize students, faculty and staff who are contributing to making the University a leader in sustainability among postsecondary institutions. The President’s Sustainability Leadership Awards are intended to raise awareness of the important work that sustainability champions are doing at York, to provide much-deserved recognition of their work, and to encourage others to get involved in sustainability initiatives on our campuses. Up to five awards will be given out each year. Cochrane oversees York University’s Energy Management program, focusing on ensuring efficient heating, cooling and power for York’s 115 buildings and eight-million square feet of space. He has steered York’s five-year energy renewal plan, aimed at a 25 per cent reduction in utility consumption. His tenacious pursuit of energy rebates has provided dramatically more energy improvements than originally thought possible, specifically resulting in doubling financial incentive grants to the University. This has resulted in more than $1.5 million in additional funds, which are being further invested in new energy conservation measures. An outstanding professional and true steward of sustainability planning and practices, Cochrane is deeply involved with York faculty and researchers from Environmental Studies, Engineering and Science to explore common goals and potential partnerships. A long serving York employee, Haagsma epitomizes sustainability in action. He is educated as an entomologist, a branch of zoology focusing of insects. This has served him well in his capacity as grounds manager, given the challenges that this area has faced with infestations, including the Asian Long Horn Beetle and more recently the Emerald Ash Borer (EAB). Haagsma was quick to act at the first evidence of EAB, developing a management plan to save as many Ash trees as possible. His work on the Ash tree inventory and audit led to a full tree inventory of both campuses. Haagsma is also an advocate for conscientious waste behavior, and has been a key player in the roll out of a comprehensive recycling program and organic waste collection program that has achieved a landfill diversion rate of over 65 per cent. He was an early advocate for sustainable landscapes, including xeriscaping. Haagsma has fostered excellent relationships with faculty, staff and students, and is a constant volunteer for initiatives to improve the campus environment. Psathas works with many CSBO and York departments and divisions, and is a committed champion of the importance of sustainability in all development projects—from campus greening to reuse and recycling of material, energy conservation, and renewable energy concepts. She has contributed significantly to York’s corporate sustainability profile by participating in various committees and institutes, including the President’s Sustainability Council and IRIS Executive Board. Her participation in the York Master Planning and Facilities Committee allows her to ensure that the need for sustainable development is recognized and respected at the highest level of the institution. Psathas also stewards and supports environmental initiatives such as Lights Out, Campus Cleaning, YorkWise! and Res Race to Zero. She has personally managed a number of projects related to improving the greening of the campus, including Osgoode Green, the University Tree Inventory, and improvements within the Glendon forest. Her management of various sustainable transportation initiatives has resulted in York’s ZipCars and Smart Commute programs. Psathas has also been a champion of accessibility on campus, ensuring that new development projects recognize and respect the need to remove barriers to accessibility. As a subset of Osgoode’s Environmental Law Society, the Sustainability Committee is run entirely through committed student volunteers who have gone well above the call of duty to create a more sustainable campus. The committee established five sub-groups to tackle the challenges that mattered most to students, and as such, has a very wide breadth and has significantly improved sustainability at Osgoode and the wider York community. The committee initiated a Food Advisory Group to discuss food sustainability and waste management with on-campus food providers, resulting in the reintroduction of Fair Trade coffee, reusable mugs and cups, and promotion of Aramark’s Vegan Mondays initiative. The committee also developed an Osgoode Campus Group, which led a to Lighting Efficiency signature campaign, established an e-waste bin in the Osgoode building, and created a double-sided printing poster beside Osgoode library printers to encourage students to save paper. Their events group has also worked to involve all students in programs to make campus more sustainable, including their Lug-A-Mug campaign and Fork Drive, in which students returned/donated metal forks, spoons and knives to the bistro. Overall, the Osgoode Sustainability Committee has made considerable contributions to the sustainability of Osgoode and the greater York Community over the past year. The CSBO Planning and Renovations Unit has a longstanding commitment to green building as evidenced through early citations and awards. This 20-plus member group includes six LEED Accredited Professionals. Annually, the group undertakes approximately 200 projects ranging in scale, complexity and cost. Projects are undertaken with consideration to sustainable practices, starting with the most efficient means of delivering the project, including the reuse of existing materials, including lighting, as well as other passive green design strategies. Solutions include practices in energy efficient building systems to reduce energy consumption and minimize York’s carbon foot print, minimize waste and maximize resource deployment by focusing on every opportunity for reuse. There are many examples of the unit’s innovative thinking and practice on sustainable building, including the development of the Sherman Health Sciences Building, which saw the adaptive reuse of York’s old ice rink into a state-of-the-art, world-class research facility through sustainable strategies such as bringing natural light into the interior for energy savings, incorporating a high-albedo roof, landscaping with drought-resistant native plants and storm water runoff management. By re-purposing the arena, an incredible York facility was created, adding value to the campus and bringing new life to an old structure.